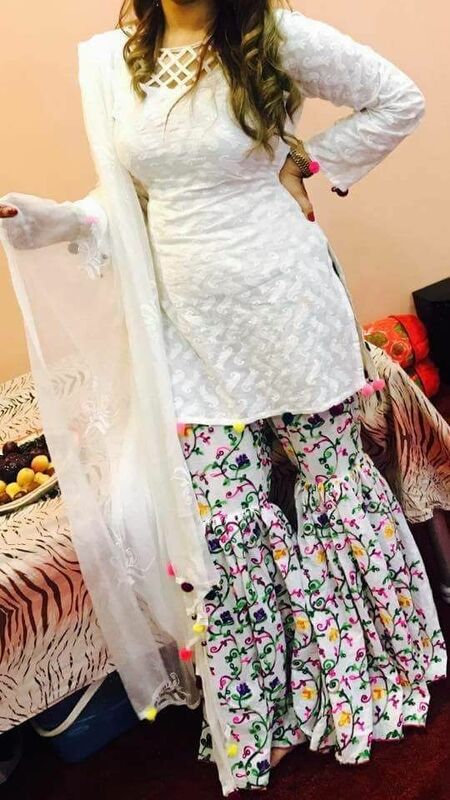 Gharara pants- How it looks like? If you want to know about these pants in detail, then let me tell you how it looks like? These pants are wide-legged from the lower side, little bit crimped from the knee. It’s up to you what type of colour you chose for Gharara pants. You can have printed, embroidered and plain pants to best match with your attire. You can put lace, motifs and embroidery of any type. You may have seen several brands are offering a broad range of formal and semi-formal pants. From the lower side, it gives a glance of bootcut pants. You can have lace around the ruched knee. These pants fit best in any body shape. So you can easily carry these pants easily on every occasion. These days transformations are at peak. 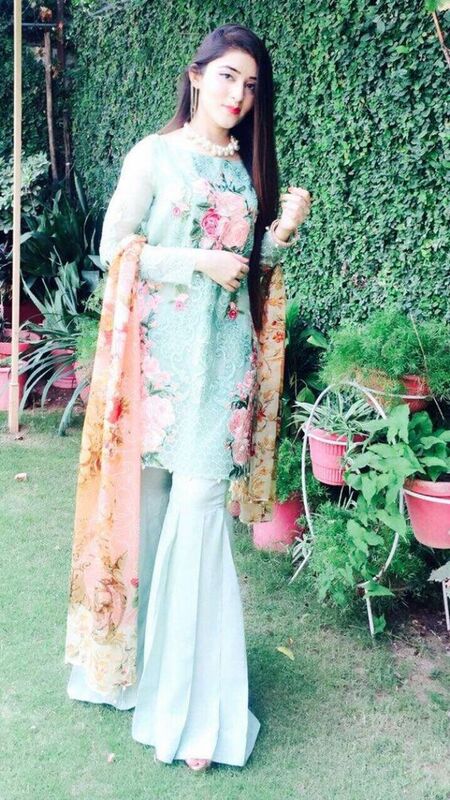 Thinking of Gharara? You can’t say this is only for wedding seasons. You would be pleased to hear that now Gharara pants are introduced for your formal wear. So don’t waste time in just imagining either you should go with this in casual or not. It can wear with a printed shirt or embroidered one. You can make your combination to fit best with these pants. 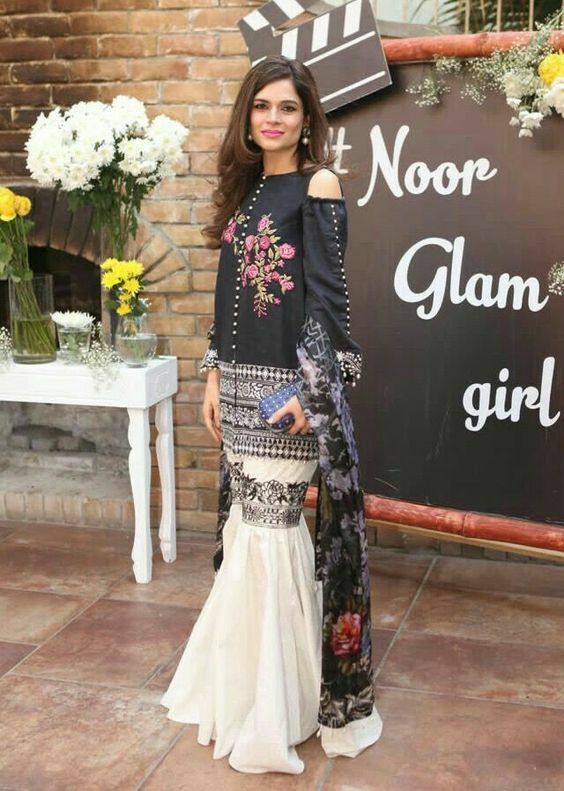 You can take a look at latest collections of Sania Mastakiya, Nomi Ansari, Maria B, HSY and many others who are adding these pants to all the latest collection. Yep, this is acknowledging all the brands, and they are bringing eye-catching contemporary designs to give you standout appearance in gatherings. It doesn’t matter you have to go college, office meeting and for any seminar, you can proudly wear this to give your personality a traditional look. If you love bell bottom trouser lover, then it wouldn’t be difficult for you to add this to your stylish shirts. It will give you an elegant personality, and you can easily carry with your daily wears. 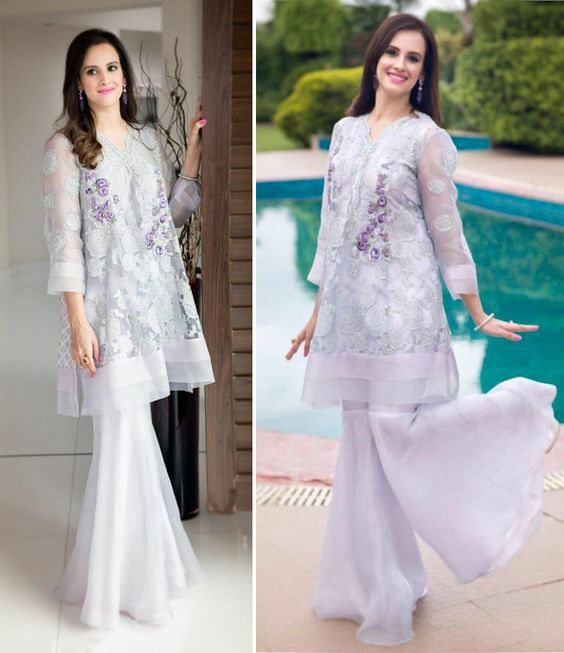 Apart from all the traditional Lehngas nowadays all the brides are preferring Gharara pants. You would love to see the fancy embroidery work and all kind of Zari and Gota work. 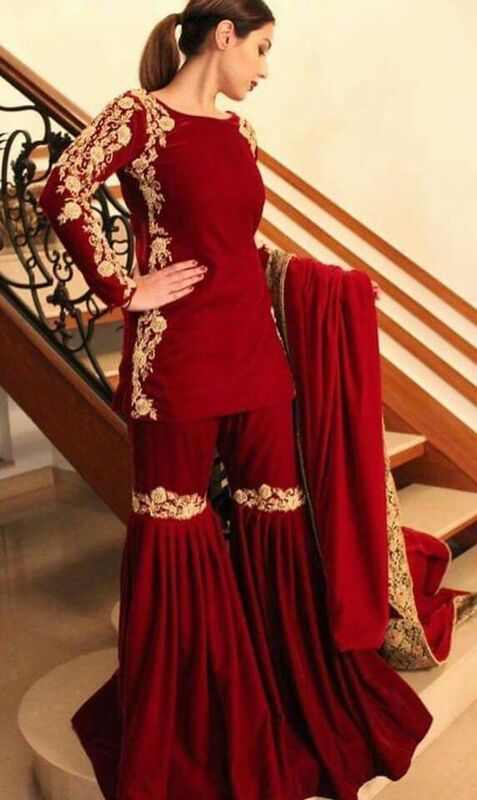 Brides are also opting this, especially for Mehndi, Barat and Walima dresses. If you are a bride to do soon then add this to your attire either for one day. It will be a unique experience and easy to carry as well. You can have detail embroidery as per your choice. 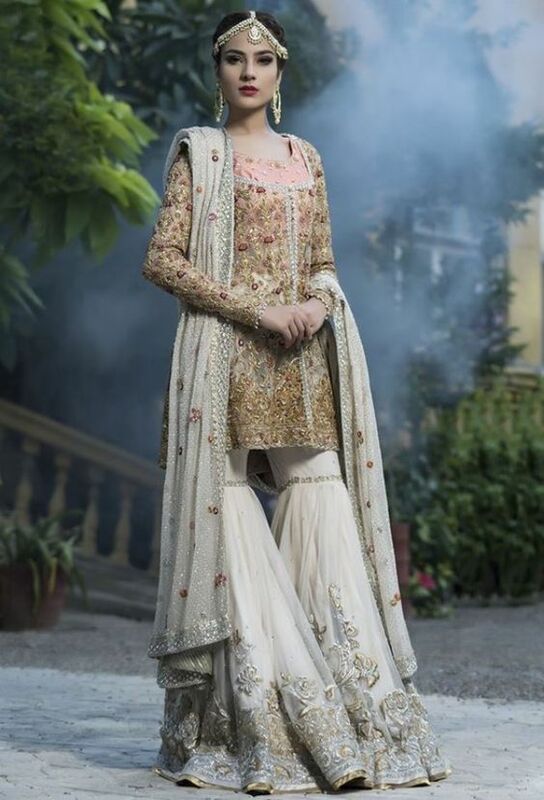 You can see designers wedding collections how they have indulged their selves in giving traditional Gharara pants a trendy look for brides. Leave all the traditional attires that were fascinating you and opt this. Majority brides love to have these in heavy embroidery, and some prefer lightweight embroidery especially for mehndi functions. Let’s take a look at designs that would leave you stunned. We have discussed almost every age group then how can we forget little angels? Various designers are giving a traditional look to these angels as well. So they can get to know about traditions. If their mommies are wearing these pants then how can you keep them away from these? Take a look at how they are capturing the attention of several ones, and probably they fit best with their moms. Several designers have showcased their collections for little girls as well. They can wear these pants with Eid and wedding functions dresses. So if you haven’t got Gharara pant for your little angels then don’t waste time and grab this for coming occasion. Mostly we get inspirations from our celebrities. If we have to go on part or wedding then before going to any designer or market we first login to all the magazine sites to check out our celebrities. We used to see what they have worn to a recent function and much more things. Best Stylo is bringing some celebrities looks to give you inspiration for your next occasion so try out these. You will have fantabulous experience.